The first gold rush in the United States occurred not in California in 1848 but in north Georgia in the late 1820s. The discovery of rich deposits of gold combined win the peculiar politics of the era to prompt the establishment of a branch mint in Dahlonega. Then miners were able to bring their gold to the mint, have it assayed, and receive gold coins in return. The story of the mint – its establishment, construction, operations, failures, and eventual closing – is a fascinating one, full of conflict and a compelling cast of characters. But this account of the Dahlonega Branch Mint is much more than a fascinating story. The cast of characters was involved in a much larger drama. The events surrounding the establishment and operations of the mint reflect the social, political, and economic history of the antebellum United States. In Dahlonega, as elsewhere during the Age of Jackson, the social, political and economic equality for which the age is so noted was more hoped for than real. The Dahlonega Branch Mint pleased few people besides those who were fortunate enough to get jobs there. It never coined enough gold to serve the purpose for which it was created – the relief of the nation's chronic shortage of coin. So the director of the U.S. Mint at Philadelphia charged that it was merely a “neighborhood mint.” Residents of Dahlonega complained that it was not a neighborhood institution they had no control over the appointments to its offices. Even those who did secure employment in the mint must have wondered at times just how fortunate they were when they had to defend themselves against all kinds of charges from people who were after their jobs. The Dahlonega Branch Mint closed in 1861, a victim of the Civil War, and was never reopened. But coins bearing the mint mark “D” have become collector's items in the twentieth century. In a story full of irony, that is the final one, for with all the obstacles that faced those who operated the mint, it is something of a miracle that coins perfect enough for circulation were produced there at all. The authors' sensitivity to historical ironies and their careful and exhausting use of rare primary source materials make this a useful book or professional historians. But it is a book for everyone to enjoy. Its compelling narrative, it development of characters, its sense of humor, its lively quotations from the correspondence of the period, and its constant attention to conflict in the community combine to make reading the book a pleasure as well as a profit. A concise record of life surrounding the Dahlonega Mint's establishment, construction, 23 year operation, and demise. A colorful history based on actual letters, documents, and records from the National Archives. New color photographs of coins produced at the Dahlonega Mint and the recently discovered photograph of the Dahlnega Mint. The events surrounding the establishmetn and operation of the mint reflect the social, political, and economic history of antebellum United states. 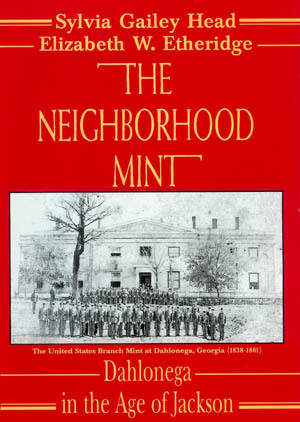 Find out why the Philadelphia Mint called the Dahlonega Mint, "a neighborhood mint." Case and quantity discounts available. Contact Al Adams for details at (404) 630-1861.